Below, we’ve collected seven viral images that you may have seen floating around places like Facebook and Twitter recently. And they’re all fake in one way or another. 1) Is this a whip made from two human spines? This photo has been going viral over the past week, and it’s easy to see why. It’s absolutely horrendous. At least it’s horrendous if you believe what people are saying about it. 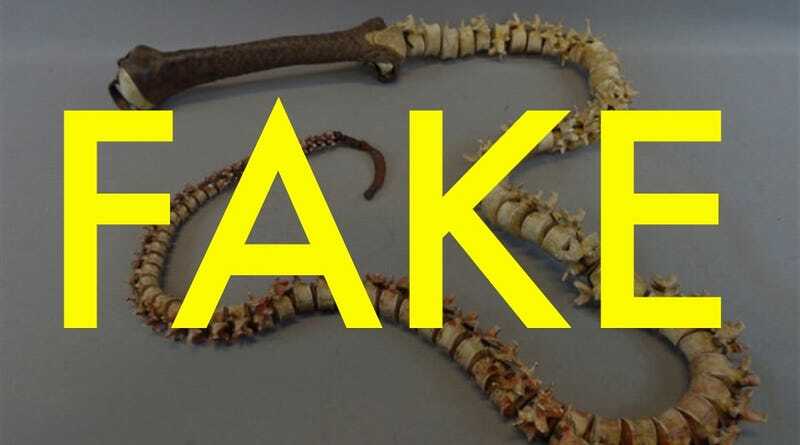 The caption of the viral tweet reads, “A whip made from two real human spines discovered in the basement of an abandoned house in Wyoming.” Can it be true? Thankfully, no. The whip is actually a movie prop from the 2014 version of Hercules starring Dwayne “The Rock” Johnson, and it appears that this photo was taken to sell the prop online. If you look around, you can even find versions of the whip with a green-screen layer added to the end of the lash. Still don’t believe us? Check out this brief battle sequence from the film. Where did the macabre tale about a human spine come from? It seems that the “real human spine” claim was first made on Reddit about 8 months ago. But even then, people in the comments were debunking it for what it really was—a movie prop. 2) Does this photo show $14 billion in cash seized from El Chapo? Trump supporters have been passing around this photo which supposedly shows billions of dollars seized from notorious Mexican drug lord Joaquín “El Chapo” Guzmán. And they’re asking why that money can’t be used to build the president’s racist border wall. For a lot of reasons, as it turns out. The photo actually shows stacks of money seized in 2007 from Chinese-Mexican businessman and alleged meth trafficker Zhenli Ye Gon. 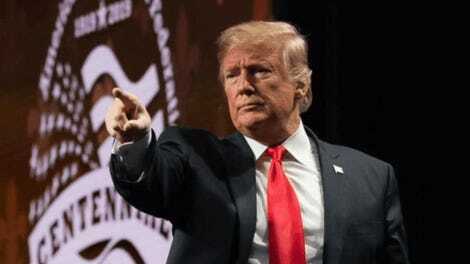 The bust, conducted by U.S. authorities in Mexico, yielded about $207 million in cash—the largest drug cash seizure in history to that point. But the photo has nothing to do with El Chapo and his recent trial. The Drug Enforcement Agency announcement about the seizure is no longer active online, but you can still view the press release thanks to the Wayback Machine, which has archived the page from 2007. How did the photo become associated with El Chapo? One possibility is this Imgur collection from February of 2014 that includes some real photos from a raid on El Chapo, but also unrelated photos thrown in for no apparent reason. It’s an impressive pile of money, but it’s not billions and it’s not El Chapo’s. 3) Is this a photo of Bill and Hillary Clinton in blackface? This photo, purporting to show former president Bill Clinton and former Secretary of State Hillary Clinton in blackface, has been around for years. It even did the rounds during the 2016 president campaign that pitted Hillary Clinton against Donald Trump. But no, that’s not the famous couple. The photo has gone viral again in the wake of a blackface scandal in Virginia. A photo from Democratic governor Ralph Northam’s old medical school yearbook resurfaced where he (or one of his friends) appears in blackface. Amazingly, Northam at first admitted that he was in the photo, then backtracked in one of the most bizarre press conferences ever. The governor has refused to step down, and other politicians in Virginia have come forward, including the Attorney General Mark Herring, to say they’ve donned blackface before as well. How do we know that the viral photo doesn’t show Bill and Hillary? Because we have eyes. It’s not them. But it is super racist. 4) Is this a horse fish found washed up on the beach? The ocean is filled with terrifying creatures. We’ve looked at plenty of them here at Gizmodo. But this so-called horse fish, which has gone viral on social media, is 100 percent fake. First spotted by viral debunker HoaxEye, this video actually shows a sculpture by artist Juan Cabana. The artist’s website appears to be down, but you can see the sculpture on the Wayback Machine, which archived the photo from 2013. 5) Is this Onondaga Lake in Syracuse, New York? If you’ve ever been to Syracuse, you’d know this is not a photo of Syracuse. Not even close. But that didn’t stop someone from posting a video claiming precisely that. Why? It looks like the original poster was joking. But that didn’t stop people from taking it seriously. Syracuse.com even posted about the video, complete with its own debunker. The news website mentions that the video has racked up over 13 million views, which means that you can probably bet a fair number of people believe this video is from New York. 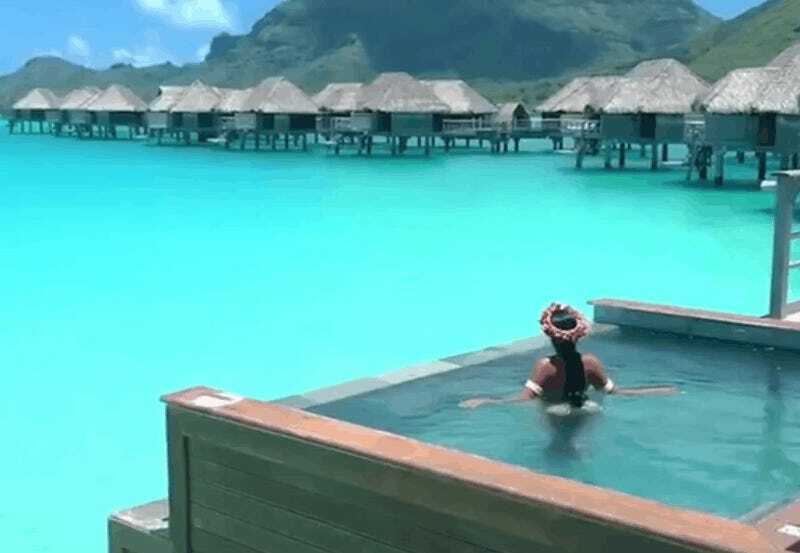 The video actually shows Bora Bora in French Polynesia. Onondaga Lake obviously looks a little different, as you can see from the Associated Press photo below. In fact, the lake has the ominous distinction as one of the most polluted bodies of water in the United States. 6) Did actor Kurt Russell call Democrats enemies of the state? Right wing social media has been sharing a graphic of Kurt Russell recently, saying that the Democrats want to abolish the 1st Amendment (which covers freedom of speech and religion), the 2nd Amendment (which covers guns), the 4th amendment (which covers privacy), the 5th Amendment (which covers self-incrimination), and the 6th Amendment (which covers the right to a speedy public trial). That’s quite a list, but it doesn’t stop there. The graphic also claims that Democrats want to abolish the Senate, the electoral college, the Supreme Court, borders, and ICE. The only problem? Russell never said any of that. The Facebook group America’s Last Line of Defense published one of the most viral versions of the photo and has so far racked up over 16,000 shares. As Snopes points out, a similar sentiment was expressed on a fake Twitter account that used a photo of Kurt Russell as its avatar. The account wasn’t run by Russell. Russell has previously described himself as a libertarian in interviews and says that he doesn’t like when actors talk about politics. So if you see quotes from him calling one side or the other “enemies of the state” you may want to be skeptical. He probably didn’t say that. And in this case, he definitely didn’t say it. 7) Was Alexandria Ocasio-Cortez fired from Hot Dog on a Stick in 2008? The Baby Boomers social media seem obsessed with new Democratic congresswoman Alexandria Ocasio-Cortez. They don’t like her policies of democratic socialism, and they especially don’t like the fact that she’s a woman. Conservatives also allege that she’s dumb and incompetent, perhaps best encapsulated by this image that’s been doing the rounds claiming that AOC was fired from the fast food chain Hot Dog on a Stick. Needless to say, this photo doesn’t even show her at all. Where to even begin? Perhaps with the fact that the photo doesn’t look like AOC. But if you need further proof let’s zoom and enhance like we’re in a 1990s computer crime drama. There it is. The name on her hat says Stephanie. And as you might know rather intuitively, Stephanie is not the same name as Alexandria. The photo appears to have originated on Flickr and was posted as early as 2008. The image is also tagged with references to roller derby in Los Angeles. Again, I can’t believe we have to say this, but that’s not AOC. Of couse Snopes says it’s false. Anything negative about liberalism, communism, demoncraps, or whatever they believe is categorically stated false. They’re a shill for LSM and have ties to Soros, and othe NWO organizations.